390 pages | 47 Color Illus. | 100 B/W Illus. Understanding mathematical modeling is fundamental in chemical engineering. This book reviews, introduces, and develops the mathematical models that are most frequently encountered in sophisticated chemical engineering domains. The volume provides a collection of models illustrating the power and richness of the mathematical sciences in supplying insight into the operation of important real-world systems. It fills a gap within modeling texts, focusing on applications across a broad range of disciplines. The first part of the book discusses the general components of the modeling process and highlights the potential of modeling in the production of nanofibers. These chapters discuss the general components of the modeling process and the evolutionary nature of successful model building in the electrospinning process. Electrospinning is the most versatile technique for the preparation of continuous nanofibers obtained from numerous materials. This section of book summarizes the state-of-the art in electrospinning as well as updates on theoretical aspects and applications. 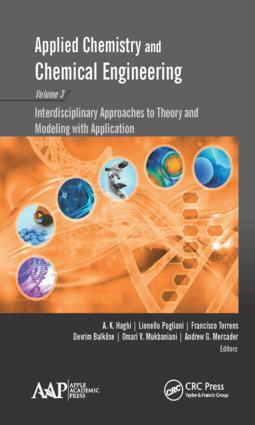 Part 2 of the book presents a selection of special topics on issues in applied chemistry and chemical engineering, including nanocomposite coating processes by electrocodeposition method, entropic factors conformational interactions, and the application of artificial neural network and meta-heuristic algorithms. This volume covers a wide range of topics in mathematical modeling, computational science, and applied mathematics. It presents a wealth of new results in the development of modeling theories and methods, advancing diverse areas of applications and promoting interdisciplinary interactions between mathematicians, scientists, engineers and representatives from other disciplines. A. K. Haghi, PhD, holds a BSc in urban and environmental engineering from the University of North Carolina (USA), an MSc in mechanical engineering from North Carolina A&T State University (USA), a DEA in applied mechanics, acoustics and materials from the Université de Technologie de Compiègne (France), and a PhD in engineering sciences from Université de Franche-Comté (France). He is the author and editor of 165 books, as well as 1000 published papers in various journals and conference proceedings. Dr. Haghi has received several grants, consulted for a number of major corporations, and is a frequent speaker to national and international audiences. Since 1983, he served as professor at several universities. He is currently Editor-in-Chief of the International Journal of Chemoinformatics and Chemical Engineering and Polymers Research Journal and on the editorial boards of many International journals. He is also a member of the Canadian Research and Development Center of Sciences and Cultures (CRDCSC), Montreal, Quebec, Canada. Lionello Pogliani, PhD, was Professor of Physical Chemistry at the University of Calabria, Italy. He studied chemistry at the Firenze University, Italy, and received his postdoctoral training at the Department of Molecular Biology of the C. E. A. (Centre d’Etudes Atomiques) of Saclay, France, the Physical Chemistry Institute of the Technical and Free University of Berlin, and the Pharmaceutical Department of the University of California, San Francisco, CA. Dr. Pogliani has coauthored an experimental work that was awarded with the GM Neural Trauma Research Award. He spent his sabbatical years at the Centro de Química-Física Molecular of the Technical University of Lisbon, Portugal, and at the Department of Physical Chemistry of the Faculty of Pharmacy of the University of Valencia-Burjassot, Spain. He has contributed nearly 200 papers in the experimental, theoretical, and didactical fields of physical chemistry, including chapters in specialized books. He has also presented at more than 40 symposiums. He also published a book on the numbers 0, 1, 2, and 3. He is a member of the International Academy of Mathematical Chemistry. He retired in 2011 and is part-time teammate at the University of Valencia-Burjassot, Spain. Devrim Balköse, PhD, is currently a faculty member in the Chemical Engineering Department at Izmir Institute of Technology, Izmir, Turkey. She graduated from the Middle East Technical University in Ankara, Turkey, with a degree in chemical engineering. She received her MS and PhD degrees from Ege University, Izmir, Turkey, in 1974 and 1977 respectively. She became Associate Professor in macromolecular chemistry in 1983 and Professor in process and reactor engineering in 1990. She worked as research assistant, assistant professor, associate professor, and professor between 1970–2000 at Ege University. She was the Head of Chemical Engineering Department at Izmir Institute of Technology, Izmir, Turkey, between 2000 and 2009. Her research interests are in polymer reaction engineering, polymer foams and films, adsorbent development, and moisture sorption. Her research projects are on nanosized zinc borate production, ZnO polymer composites, zinc borate lubricants, antistatic additives, and metal soaps. Omari Vasilii Mukbaniani, DSc, is Professor and Chair of the Macromolecular Chemistry Department of Iv. Javakhishvili Tbilisi State University, Tbilisi, Georgia. He is also the Director of the Institute of Macromolecular Chemistry at Iv. Javakhishvili Tbilisi State University. He is a member of the Academy of Natural Sciences of Georgia. For several years he was a member of advisory board and editorial board of the Journal Proceedings of Iv. Javakhishvili Tbilisi State University (Chemical Series) and contributing editor of the journals Polymer News, Polymers Research Journal, and Chemistry and Chemical Technology. His research interests include polymer chemistry, polymeric materials, and chemistry of organosilicon compounds, as well as methods of precision synthesis to build block and the development of graft and comb-type structure. He also researches the mechanisms of reactions leading to these polymers and the synthesis of various types of functionalized silicon polymers, copolymers, and block copolymers. Andrew G. Mercader, PhD, studied Physical Chemistry at the Faculty of Chemistry of La Plata National University (UNLP), Buenos Aires, Argentina, from 1995-2001. Afterwards he joined Shell Argentina to work as Luboil, Asphalts and Distillation Process Technologist, as well as Safeguarding and Project Technologist. His PhD work on the development and applications of QSAR/QSPR theory was performed at the Theoretical and Applied Research Institute located at La Plata National University (INIFTA). He received a post-doctoral scholarship to work on theoretical-experimental studies of biflavonoids at IBIMOL (ex PRALIB), Faculty of Pharmacy and Biochemistry, University of Buenos Aires (UBA). He is currently a member of the Scientific Researcher Career in the Argentina National Research Council, at INIFTA.